Festa Major de Gràcia is around the corner! If you haven’t been to Gràcia, then the best time to go is during the annual Festa Major, which Gràcia celebrates every August 15-21. Especially this year, as Gràcia celebrates its bi-centennial anniversary with over 1 million revelers expected to visit the celebrations this year. Spain is famous for fiesta… it’s a way of life here, and Gràcia hosts a stunning event. The planning for Festa Major de Gràcia is delegated to around 20 different street or neighbourhood associations. They are tasked with preparing the district to hold over 600 performances and many other activities, which include children’s workshops, puppet shows and kid’s fun fair rides among many other things to see and do which are great family options. The agenda is actually a very guarded secret, but there are programmes available to buy that have all the information from the first day. A good place to start is Plaça de la Vila de Gràcia as it is right in the centre of the all action. It’s very lively all year round with bars surrounding the square and a beautiful clock tower in the middle. Most of the main traditional events will take place there and the processions normally finish there too. Two are worthy of particular mention, the Castellers and the Correfoc. 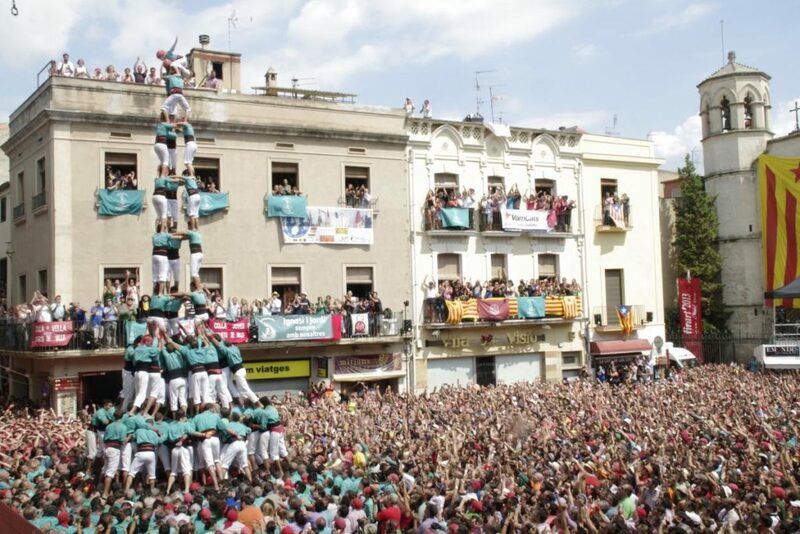 Castellers – the creators of human towers – compete with each other all around the country to build the highest towers. With determination triumphing over brute strength, participants climb on top of each other, interlocked into a delicate balancing act to get people to the highest point possible. The Catalans are very good at building human structures. The last few world records – 10 persons high – have been held firmly in the region. These normally take place where Plaça de la Vila de Gràcia meets Plaça Rius i Taulet. 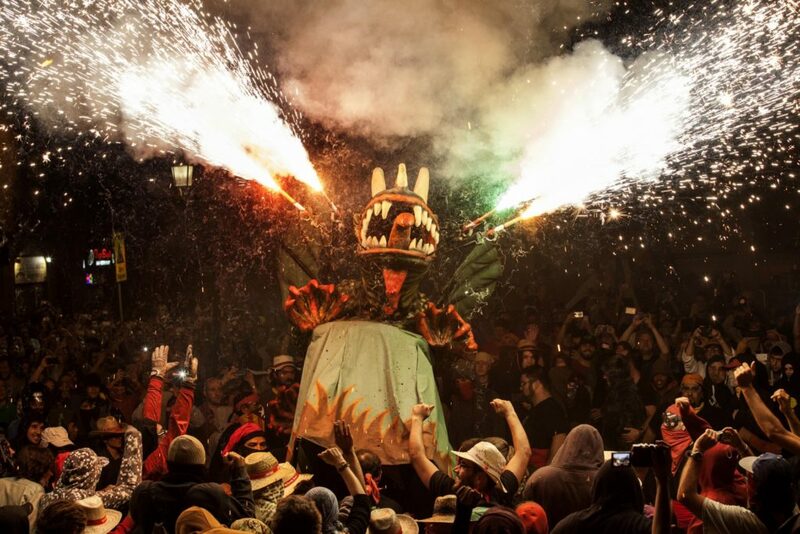 The traditional Correfoc is fiery dance spectacular on the last night with dracs (dragons), diables (devils), pyrotechnics and loud rhythmic marching percussion, all together representing hell. It’s an age-old tradition of devils dancing in a long procession through the Festa Major de Gràcia with groups of diables hoisting their pitchforks, or forques, with spinning fireworks that spray in all directions. Unless you’e part of the procession, stay well back, as all the devils wear protective clothing and you might not. 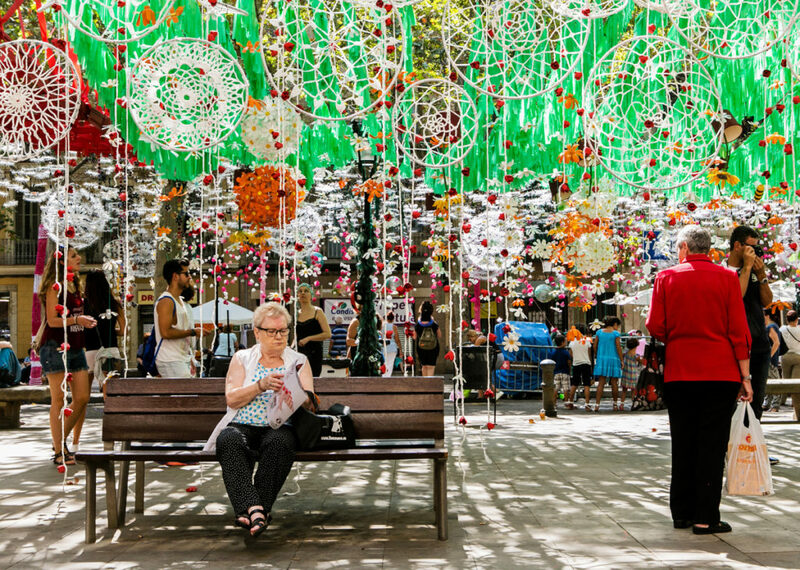 What sets Festa Major de Gràcia apart from others is the scenery and artwork. The work begins many months before the event, even as soon as the previous year’s event finishes. 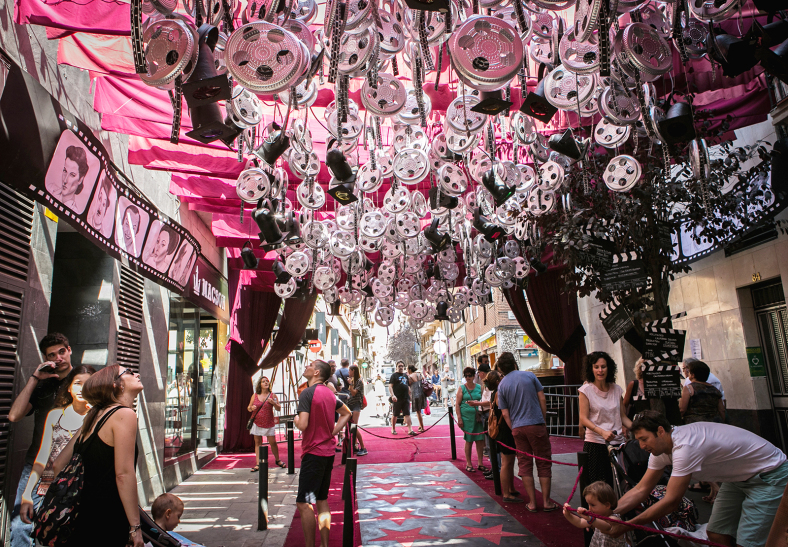 Local tradesmen and volunteers band into the associations, each representing a street or square in the neighbourhood, to become set-designers, together creating all the elaborate décor that festoons streets and squares. There is a competition between each association – which also includes a sports contest – so local pride is at stake as each association battles it out for the best-decorated street, the most coveted prize. Over the years there have been some fantastic pieces, yet this year the standard is expected to be even higher for the Bicentennial. Expect themed streets with huge papier maché displays suspended along the street above the heads of all passersby. The residents don’t have to be in an association to compete either, as neighbours may also enter to win the contest for best-dressed balcony. There will be street bars, local gastronomic delights, traditional dancing, as well as the live music concerts on most of the area’s squares and streets. There are a great number of performers, mostly local to the neighbourhood. The live music really takes off when the night draws in. In the past, Festa Major de Gràcia has even hosted guest performers like Tom Jones in Plaça del Sol, which is one of the largest squares and is famous for musical performances which will entertain you with Catalan and international sounds. 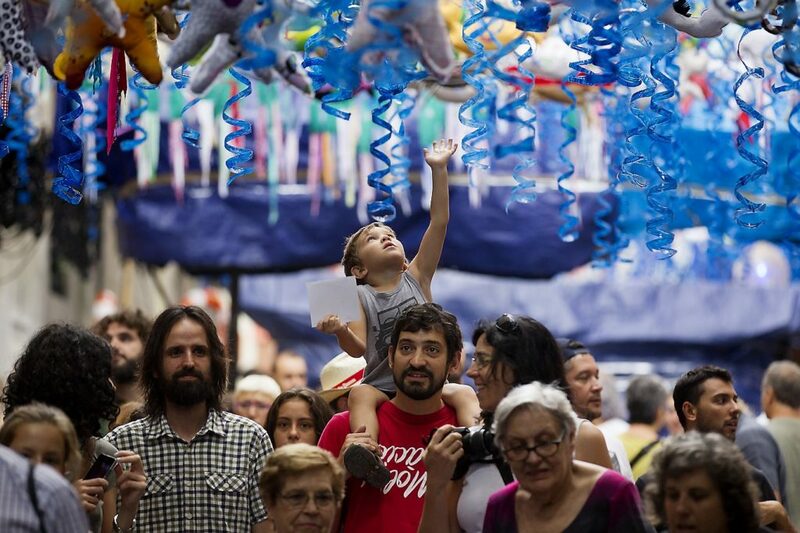 Most importantly, the Fest Major de Gràcia is about community and tradition. The people are very welcoming… the best thing to do is just take your time and take a walk through the neighbourhood, as Gràcia is easily navigable and the festival lasts for an entire week.